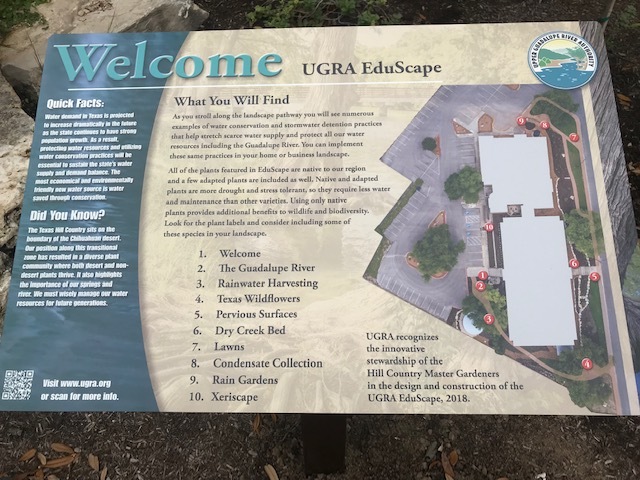 IIn February 2017, a committee of Hill Country Master Gardeners was invited to design a plan to renovate the UGRA property at 125 Lehmann Dr, in Kerrville TX. The purposes of the new landscaping are to enhance the appearance of the property, to use water wisely, and to educate about and demonstrate the principles of Green Stormwater Infrastructure. Elements include numerous water-wise structural changes, an educational walking path, and installation of native and adapted plants selected for use in the Hill Country. The plan was approved by the UGRA Board in May 2017. The project director asked the Master Gardener committee to continue advising during bidding, construction, and installation. Existing water and irrigation lines were repaired and replaced, and two rainwater storage tanks were installed in 2017. Along with the construction project, the Master Gardeners joined with UGRA, the City of Kerrville, TX A&M Water University, and other partners to present a seminar for government planners, private contractors and interested citizens to learn more about Green Stormwater Infrastructure in January 2018. Installation of paths and plants were completed by summer 2018. Elements coming soon include seating areas, educational signage, plant ID tags, and coordinating online information. Click here to see the Gallery of PIctures of the Completed Project!